Irrespective of what you may think about website monetization, quality traffic is a valuable resource that makes everyone run after it. It acts as a vital bloodline for your website, supplying it with old and new audiences while feeding off their interaction with the content in order to generate ad revenues. In case of the latter, being able to have a comprehensive and clear overview of what happens with your traffic-related parameters means completing half the job in one’s advertising campaign. RevenueHits ad network was well aware of this when it approached designing its publisher’s dashboard with a clear focus on making it informative, analytical, user-friendly and visually appealing at the same time. Use this opportunity to read on about the ways in which RevenueHits can help you optimize your web monetization strategy by giving you access to its performance-focused dashboard. If you have a blog or any other type of website whose content you monetize for profit, you are bound to feel the burden of being on the constant lookout for the trusty allies that will share your marketing vision. In order to turn this vision into a lucrative endeavor, picking the right ad network partner can be a considerable challenge at the time of relentless competition and uncritical promotion of the Google AdSense option. At the same time, bloggers and publishers are often faced with the dilemma regarding the need for balancing their monetization efforts in form of displayed ads with the overall user experience they have to avoid compromising if they are to protect their audience. RevenueHits offers an uncompromising answer to this conundrum, in form of the broad range of ad types it serves on your website. It positions itself a mediator between you, your audience and advertisers, while focusing on meeting the needs of all parties involved. First of all, it offers automation of the ad placement process while implementing features such as visitor tracking, targeting and optimization of ad placement via contextual and geotargeted ad serving technology. This easily translates into having access to a robust monetization engine for your toolbars, widgets, search and messenger applications, whose potential was recognized by the community of more than 20,000 publishers that regard RevenueHits as the essential building block of their business success. Yet, none of this would be possible without having a technologically advanced platform to run your ad campaigns on. The solution comes in form of RevenueHits’ native dashboard, which is designed to provide you with transparent access to all of the relevant advertising data, together with a set of tools for optimization of your marketing performance in the shortest time possible. Used in this manner, this dashboard becomes your main instrument in turning your website into a stable source of ad-generated revenue. Interaction with the dashboard is organized in the manner that allows everyone to start earning money literally minutes after signing up with RevenueHits. No matter if you are a pro or just a beginner, getting started with this ad network will be a completely frictionless experience. Initial setup is straightforward, requiring you to enter your name, e-mail and website URL, together with the information on your web publication or asset such as a blog. Following the verification of your e-mail address, you’ll be immediately provided with full access to the publisher’s dashboard. The design elements featured on this platform are easy to navigate even for non-experts, with readily available account settings and detailed information about payment preferences. Speaking of these, RevenueHits will pay you on a net-30 basis, while offering support for popular platforms such as PayPal, Payoneer or good old wire payment. As per the frequency of stat update on the dashboard, your revenues will be calculated on daily basis and made available until 12 pm CST on most occasions. Despite the daily updating of revenues, the funds still undergo obligatory auditing at the end of the month before they become operative. Since RevenueHits wants its brand to be synonymous with transparency, all payments are made according to the records featured in the publisher’s dashboard. As the statistical data need to be gathered from various advertisers, they are usually fully processed within 48 hours, with no further delays. Yet, dealing with payment means that you’ll have to stuff your pockets first, and the dashboard will once again offer to guide you through this technical aspect with no stress involved. First, you’ll need to create an ad placement, which is done in a seamless and accessible manner. It starts with your clicking on the appropriate button on the dashboard, after which you’ll be offered to create your initial placement. Once you decide on the ad format and the type of placement (both mobile and desktop are supported), you’ll just have to name it, indicate its place, and provide a short description for it. What’s more important in addition to the dashboard’s intuitiveness is its role in helping you track your performance and plan ahead with your monetization strategies. The dashboard gives you detailed insight into vital performance parameters such as total impressions, clicks, eCPM, CTR (%) and revenue made within a set timeframe. In order to allow you to improve your strategy for the long run, the dashboard also features a simple line graph which represents performance across the last eight days. 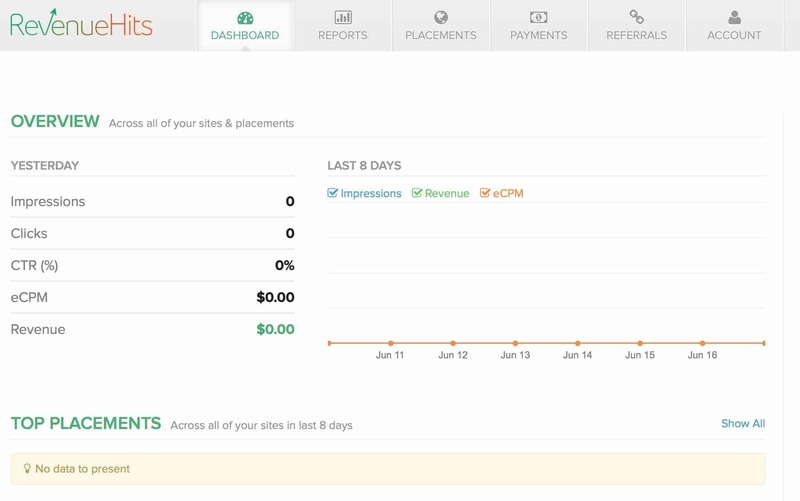 In addition to this, the dashboard will give you access to a list of your top placements across all of your websites. This serves as an accessory to your monetization planning by showing you areas that may require your attention, as well as ad placements that are ripe for additional optimization. The dashboard also offers more detailed reports which are made easily accessible by means of filter options for any website or placement within a timeframe that you set. Publishers’ interfaces are not mere bridges connecting users with key performance data from their advertising campaigns. RevenueHits offers an intuitively and conveniently designed dashboard for publishers that want an accessible and comprehensive tool for going forward with their monetization strategies. Quality visualization and easy navigation of key performance metrics offer insight into a veritable treasure trove of data that can be filtered and analyzed by users of variable technical backgrounds. In their hands, RevenueHits’ dashboard will become a technologically advanced springboard for turning their advertising campaigns into sound and profitable business endeavors.